The Election Commission of India has appointed 40 observers for the state to ensure free, fair and transparent elections effectively. Besides 30 general observers, 10 expenditure observers will keep a watch on various aspects related to the election. With a high level of political awareness among the electorate the anti-incumbency sentiment has been a playing a major role in deciding the outcome of the Assembly elections in the hill state. The party in power has been ending up as the loser in the past four Assembly elections. The screening committee of the Congress for the Himachal Pradesh elections has decided to send single names to the party’s central election committee on nearly two thirds of the 65 seats due to go to polls on December 19. A full court reference was held at the high court here today to mourn the sad demise of Justice R.S. Pathak, former Chief Justice of India and former HP High Court Chief Justice. Former chairman of the Subordinate Service Selection Board S.M. Katwal has filed a petition in the high court demanding handing over of the inquiry regarding the alleged audio CD released by BSP leader Vijay Singh Mankotia against Chief Minister Virbhadra Singh and his wife Pratibha Singh to the CBI. Justice M.R.Verma, chairman of the Himachal Pradesh Administrative Tribunal, has dismissed two petitions and slapped a cost of Rs 5,000 each for tampering with their service record. The administration has served notices on 11 persons for allegedly occupying government land in the depot bazaar of the town for the past about 25 years without giving the lease amount to the authorities concerned. Vivek Kumar Sareen, an 18-year-old class XI student, who has been diagnosed to be suffering from malignant bone tumour (osteosarcoma) by doctors of the PGI, Chandigarh, is fighting for his life. With the arrival of the palanquin of Lord Parshuram on the bank of the Renuka lake, the state-level Renuka fair, the biggest cultural and religious event of Sirmaur district, commenced here today with traditional fervour. Services team were declared champion of the 18th National Kayaking and Canoeing championship among men and the ASCB team were declared runners-up. In the women section, Kerala team were declared the national champion and the Andeman Nicobar team were the runners-up on conclusion of the five-day tournament here this afternoon. The police has released a photograph of the woman who was found dead in a local hotel room in Assam, West Bengal, UP and the North-Eastern states as there are still no specific details available about the man who accompanied her when they booked into the hotel on November 16. A husband murdered his wife on suspicion of infidelity at Kiari village, near Shahpur, in Kangra district late last night. The police arrested the culprit today. The police has also taken in custody the sharp-edged weapon used to commit the murder. One Sanjay Kumar, son of Ramfal of Danaur in Sonipat district of Haryana, was nabbed by the police here on Monday carrying 1 kg of charas. He was coming from the Bhekhali-Byasar road to Kullu when the police caught him at a naka near Ramabai about 2 km from here. Six huts were gutted in a fire at Malpur in the Baddi-Barotiwala and Nalagarh industrial area of the district late last night, the police said today. Former agriculture minister Vidya Sagar has lambasted the government for its alleged failure to provide fertilisers to farmers during the current rabi season. General category employees and officials of the state government held a gate meeting in front of the DC office against the implementation of the 85th constitutional amendment by the state government today. Chief electoral officer Manisha Nanda here today said nomination for the 2nd phase of poll for remaining 65 Assembly constituencies would be issued on November 23. The last date for making nomination will be November 30 and scrutiny of nomination papers will take place on December 1. The last date for withdrawal of candidature will be December 3.Polling for the 2nd phase will be held on December 19. Nanda further said the counting for both the phases will take place on December 28 and the election process will be completed by December 31. Elaborate arrangements have been made to complete the process transparently and peacefully, she added. THE Congress is looking for a new candidate from Chamba, with housing minister Harsh Mahajan opting out of fray on account of personal reasons. According to party sources, Mahajan, who was summoned to Delhi by the high command, met Sonia Gandhi and explained the reasons for his inability to contest the elections. He had earlier spoken to various other central leaders in this regard but the party leadership was keen to field him from Chamba and pressure was being put on him from various quarters to contest the elections. It is learnt that during his meeting with Sonia Gandhi he was firm on quitting electoral politics but expressed willingness to take up organisational work to strengthen the party. He is reported to have said that he had been mostly involved in party work at various levels starting from NSUI, Youth Congress and finally the PCC and had proved his mettle both in the organisational work as well electoral politics. The party, however, could utilise his services in whatever way it wanted, he offered. Mahajan confirmed that he would not contest the poll. The last time a party in office managed to retain power was in 1985 when the Congress returned with a thumping majority, riding the sympathy wave in the wake of Indira Gandhi’s assassination. It was an unusual poll during which the BJP was wiped out at the national level, winning only two Lok Sabha seats. No Chief Minister has been able to bring his party back to power ever since. While the Congress lost elections with Virbhadra Singh as the Chief Minister in 1990, the BJP was routed at the hustings with P.K.Dhumal in the saddle in 2003. The battle was even in 1998 when the Congress went to the polls under the leadership of Chief Minister Virbhadra Singh. The Congress secured 31 out of 65 seats for which elections were held in the first phase but the BJP, which won only 29 seats, managed to form a government in alliance with Sukh Ram’s Himachal Vikas Congress (HVC). Shanta Kumar led the BJP to power in 1990. However, his government was dismissed in 1992 in the wake of the Babri Masjid demolition. The BJP lost the 1993 poll under the leadership of Shanta Kumar but he was not occupying the seat of Chief Minister as the state was put under President’s rule for a year. Interestingly, the tenure of the first non-Congress government formed in the state under Shanta Kumar in 1977 was also cut short following the disintegration of the Janata party in 1980. Thereafter the Congress formed a government with late Ram Lal as the Chief Minister and also contested the 1982 poll under his leadership. No party could secure a clear majority. The Congress won 31 seats as against 29 bagged by the BJP but managed to form a government with the help of Independents. Both Virbhadra Singh and Shanta Kumar led their respective parties in the Assembly poll five times each. However, Virbhadra Singh led the Congress as the Chief Minister thrice, whereas Shanta Kumar never had an opportunity to lead the BJP as the Chief Minister. Another important feature having a bearing on the outcome of the poll has been that the Congress all through had the advantage of being in power at the Centre. The BJP had such good fortune only in the 2003 poll when the Vajpayee government was in office at the Centre and Dhumal was in the saddle in the state but it still lost the elections. The committee, which met for the second time in two days, deliberated for nearly two hours to finalise its recommendations for selection of candidates. Both the Chief Minister Virbhadra Singh and PCC chief Viplove Thakur appeared satisfied with the outcome of the meeting. The Chief Minister told The Tribune later that all aspects were taken into account during the discussions on the candidate selection. Sources said the committee had formed panel of two or three names on seats where there was no consensus. All recommendations of the screening committee would be placed before the election committee that would meet in the next few days to finalise the candidates. The state Congress has urged central leaders to declare the candidates before or near the start of nomination process to give candidates maximum time to campaign in the winter days. The sources said nearly five MLAs, including associate members, have not got single-name recommendation from the committee. They said the committee had included those MLAs in the panels who it thought faced local opposition or strong anti-incumbency. The final decision on tickets of these MLAs would be taken by the election panel. The sources said the screening committee had accepted request of Harsh Mahajan not to contest but left the final decision to the party’s apex body for deciding candidates. In his condolence, Chief Justice V.K.Gupta said Justice Pathak was a towering personality, who was widely known not only in the country but also abroad for his legal knowledge. He said by his demise, India had lost someone very valuable, especially in the legal field. He enjoyed excellent reputation and soft nature and pleasing personality Justice Gupta further said Justice Pathak enjoyed excellent reputation as a Judge and his contribution to the society and Judicial system was remarkable. He said the state and its people were privileged to have Justice Pathak as the Chief Justice of HP High Court and while working as the Chief Justice he rendered important decisions which had a far reaching effects in judicial field. Advocate-general of the state Malkiat Singh Chandel said in his reference that Justice Pathak had great reputation of an honest judge and was an upright person, who enjoyed excellent reputation as a judge. Ajay Kumar Sood, member Bar council of Himachal Pradesh, Sandeep Sharma, assistant solicitor of India and Balbir Singh Chauhan, president, Bar association, also rendered obituary references. Judges of HP High Court, Justice Deepak Gupta , Justice Surjit Singh,Justice V.K.Ahuja, Justice S.S Thakur, Justice Sanjay Karol, Justice Kuldip Singh and Justice Rajeev Sharma were present The officers of the court and members of the Bar were also present. The petitioner urged the court to direct the state to hand over the inquiry in the case to the CBI or any other independent investigating agency. He urged the court to direct the state to conduct appropriate investigation based on material supplied by Mankotia. The petitioner has said in the petition that in May, 2007, Mankotia had released an audio CD containing conversation of Virbhadra Singh, his wife Pratibha Singh and former IAS officer Mohinder Lal in connection with collection of money from different business concerns for helping them in the past and in future, including clearance of some pending files with the government. The petitioner further alleged that the conversation clearly established that the above said persons had misused their official positions. Being a former administrative officer of the state he was well conversant with voices of Virbhadra Singh, Pratibha Singh and Mohinder Lal and after hearing the CD, the petitioner was of the firm view that the voices recorded in the CD were of the above said persons. Both petitions were disposed of vide a common order as a common question of law and fact was involved. Both tapplicants/petitioners Amar Nath and Jagdish Chand were working in HP PWD Division, Sarkaghat, and were regularised as a work mistry and supervisor, respectively, on January 1, 1995, as per the order of the department, but later on their appointment orders were withdrawn. . Both applicants filed original applications before the tribunal challenging that the orders of withdrawal were against the principal of natural justice. The department replied that the applicants had not competed 10 years of service but were regularised wrongly. It was further alleged that the service record was prepared with the help of applicants who had made wrong entries in the service record. It was further alleged that an anonymous complaint was received by the department that both applicants were not eligible to be regularised and on enquiry both applicants admitted that they had not worked continuously on their posts and they further admitted that they had made wrong entries in their service record. After going through the record and hearing the parties concerned the tribunal held that the applicants had committed grave misconduct/offence of fabricating their service records. The tribunal slapped a cost of Rs 5,000 on each petitioner while dismissing their petitions. SDM D.C. Rana said decades ago an eight-kanal chunk of land in a prime area of the town was given to 21 persons on lease under ‘chakota’ rules. Eleven of these persons stopped paying lease amount to the government after 1983. The other 10 had been depositing the amount, said the SDM. In ’80s, the government had amended the lease rules for such land and fixed 18 per cent of the market value of the land as the lease amount. Since, the lease amount had gone up suddenly, some of the occupants stopped paying it. The SDM said the administration had asked these occupants to deposit the amount by the end of the current year as per the revised lease rules, otherwise evacuation proceedings would be initiated against them. Vivek Kumar Sareen, an 18-year-old class XI student, who has been diagnosed to be suffering from malignant bone tumour (osteosarcoma) by doctors of the PGI, Chandigarh, is fighting for his life. The doctors have advised him to get his knee replaced so that his life could be saved. However, the family is in no position to spend Rs 1.25 lakh on his treatment. Vivek’s father Janak Raj Sareen, 43, works as a watchman at a private guesthouse on a monthly salary of Rs 1,500. Vivek complained of acute pain in his left leg in July. In August, it was found that he was suffering from malignant bone tumour. Vivek was helped by the Cancer Help Fund (Cancer Sahaita Kosh) at the PGI in carrying out chemotherapy. On November 7, he was advised by the doctors to undergo operation in two-three weeks, otherwise he would not survive. 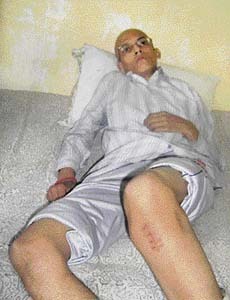 Janak Raj said if the family was not able to generate money for Vivek’s operation, the second option would be to get his leg amputated. Otherwise, he might not survive. Principal of Gurudut Anglo Vedic Senior Secondary School, where Vivek is studying in class XI, has initiated a move collect financial assistance for him. Kangra District Red Cross Society, the Vivekananda Kendra, the Sewa Bharti, the Aray Samaj and other organisations have come forward to his help, but enough money could not be generated. Anyone willing to help Vivek may send cheques or drafts to the Principal of GAV Senior Secondary School, Kangra. 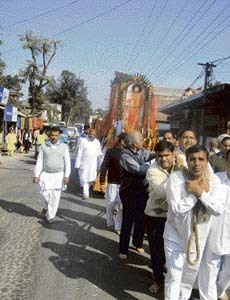 The palanquin of Lord Parshuram was brought in a traditional procession from the ancient temple in Jamu Koti village to the Senior Secondry School ground on the bank of the Giri river at Dadahu. The ceremony to welcome the palanquin of Lord Parshuram was performed in the ground as per tradition, along with all other palanquins. The occasion was witnessed by thousands of local residents and visitors. In the afternoon, the traditional shobha yatra began from Dadahu which ended on the bank of the Renuka lake. The palanquins of Lord Parshuram and other deities were put in the ancient Parshuram temple for obeisance. It was after more than one decade that the fair began in the absence of the Chief Minister who comes here every year to inaugurate the shobha yatra of Lord Parshuram. Due to the election code political colour is completely missing from the fair. Among juniors, the ASCB team were the champion and the Andhra Pradesh team was the runners up. In the women section, Kerala was the champion and the Manipur team were the runners-up. For the first time this championship included events that had physically challenged persons participating from different states in it. The events were K-1, K-2 and K-4. In events of 200 meters finals where challenged persons participated, Bhrighu Kumar Singh of Manipur was first, Nitin Kumar Chandra of UP was second and Upla Laxman of Andhra Pradesh was declared third and were given gold, silver and bronze medals respectively in K-1 event by chief guest Mandi DC B.K. Aggrawal. In K-2 Bhrigukumar and Ranjit of Manipur were first, Nitin Kumar and Intzar Alam of UP second while in K-4 UP was first and Manipur second. Among other events for men in final K-1 the SSCB team were first, the Andman and Nicobar team were second and the ASCB team were third while in C-1 the SSCB team were first, Andhra Pradesh second and ASCB were third. Among subjunior girls in K-2 Kerala were first, UP second and J&K third and in C-4 senior men SSCB first, Indian police second and were MP third. Among senior women in K-4, Andman Nicobar were first, Kerala second and Manipur third. In subjunior boys in C-2, ASCB were first, Uttrakhand second and UP third. Before distributing prizes and trophies to the winners, the chief guest said that Himachal was fortunate as it was blessed with natural bounties of several water bodies and such events could help the state come on the adventurous sports map of the country. Present on the occasion were national kayaking and canoeing association vice-president Major-General G.S. Bindra (retired), general secretary Col B.S. Ahluwalia, HP state kayaking and canoeing association president Raja Kamal Singh, general secretary Dr. P.S. Guleria and DC Devesh Kumar among several others. With only vague details of the physical appearance of the man, who is registered as her husband in the hotel register, the police is trying to get the identity of the deceased woman established. By flashing the photograph of the woman and other details to other states, there is a possibility that her family members might get to know about the mishap here. SP Anand Pratap Singh said the autopsy report was still being awaited but the doctors too had indicated that it was likely that the woman had consumed poison. Meanwhile doctors said that traces of poison were found in the stomach of the woman. He suspected that it was likely to be a case of suicide as there are no signs of any struggle or injury marks on the body which could indicate that she was forced to consume the poison. However, it is only after the autopsy report is received that police and forensic experts can say with certainty about the exact cause of death. The SP said out of the seven cases of murder having taken place in Hotel Gulmarg, Apsara, Oaksland, Prashant, Cedar and Panchsheel, the accused had been convicted in five cases. Meanwhile it was wrongly reported in yesterday’s paper that a murder had also taken place in Hotel Rajdoot. No such incident ever took place in this hotel. The error is regretted. The police said Balwant Singh hit his 38-year-old wife, Sunita, with a sharp-edged weapon in the head late last night, killing her on the spot. Balwant Singh was under the influence of liquor when he attacked his wife. During preliminary investigation, the police had come to know that the couple had strained relations as Balwant suspected her of having illicit relations. The body was handed over to the family members for cremation after a post-mortem this evening. Balwant Singh would be produced in court at Dharamsala on Wednesday. One Sanjay Kumar, son of Ramfal of Danaur in Sonipat district of Haryana, was nabbed by the police here on Monday carrying 1 kg of charas. He was coming from the Bhekhali-Byasar road to Kullu when the police caught him at a naka near Ramabai about 2 km from here. A case under NDPS Act has been registered. SP G D Bhargava said the harvesting of charas was almost over and the charas mafia now wanted to export the contraband. The police were keeping vigil on the drug mafia, he added. The fire gutted six huts and personal belongings of 20 migrant labourers, who have been rendered homeless. The police said no loss of life was reported in the fire. Timely action by fire personnel saved two dozen huts and a BSNL tower, the report said. Property estimated to be about Rs 50,000 was gutted in the fire, the cause of which is being ascertained, the police said, adding that the affected workers were working for Cipla, Luminous, Helolas Pharma and Panishla units. The district administration has assured to compensate the affected workers. Addressing mediapersons here on Friday, he said 80 per cent of the population of the state lived in rural areas and 73 per cent was dependent on agriculture and the non-availability of fertilisers had put them in a spot. The authorities were behaving like mute spectators to the situation. He said lack of coordination between the state and the Central Government was the reason behind shortage of fertilisers. State president and district president of the Himachal Pradesh Samanya Varg Karamchari Kalyan Mahasangh Rakesh Bhardwaj and Prakash Thakur said the amendment had been implemented for providing reservation in promotion to in-service employees, but it was in contravention of the basic spirit of the reservation policy.